Why Did the Tyson Chicken Cross the Road? A lot of people don’t know this, but chickens are beautiful creatures. Think about it. What other animal has a soft, golden brown coat of feathers, large talons, exceptional speed, a beak that can pierce your skin, a monstrous cluck and beady little eyes that won’t hold a stare for longer than .25 seconds? If that isn’t beauty then I’m going to have to raise my bar a little bit higher! 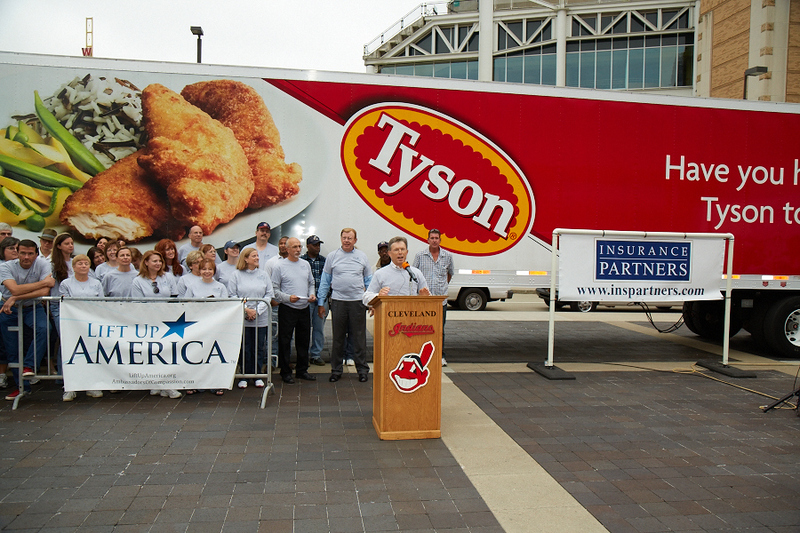 The Cleveland Indians teamed up with Tyson Foods, Inc. and Lift Up America to once again provide 30,000 pounds of protein (various types of meat) to local food agencies in the city of Cleveland. The Cleveland Foodbank assists in making sure each food agency gets a certain poundage of protein based on their size and their reach. This is the fifth year that the Indians have hosted the event and each year the need grows more and more. Eddy, the Tyson truck driver, parked his tractor-trailer right on the Gateway Plaza outside of Progressive Field as the backdrop of the distribution. Over the past decade, Tyson has donated more than 88 million pounds of food–roughly 352 million meals. With the help of 70 volunteers including employees from Insurance Partners Agency, the Cleveland Indians, the Cleveland Foodbank and Lift Up America the 30,000 pounds of food was distributed to 30 agencies in about 20 minutes! So while we may not know which came first, the chicken or the egg, I think we finally have an answer as to why the chicken crossed the road. 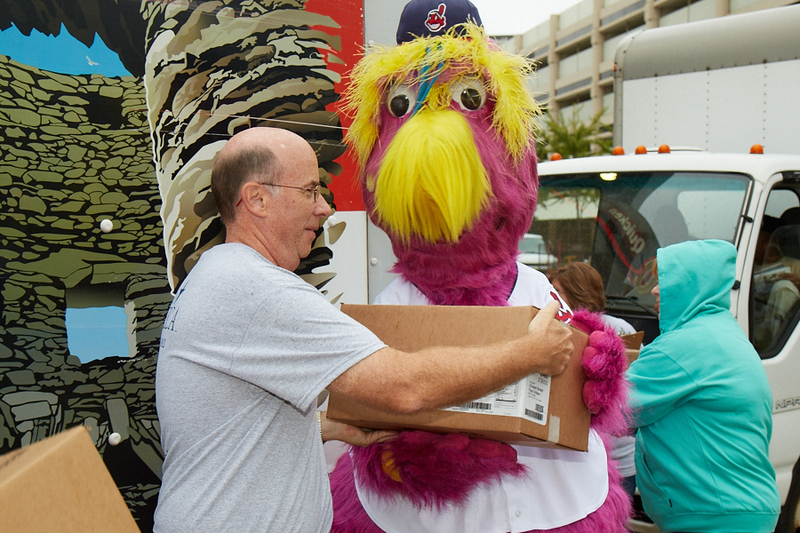 Obviously, it was to get into the Tyson Foods truck so that it can be brought to Progressive Field and passed out to local food agencies. It’s not the best punch line for a joke, but like the food distribution, it’s all about the delivery! You can take THAT to the bank…The Foodbank! Sometimes when I look back on my life, I think of all the food that I’ve wasted. There were so many times growing up that I would just not eat all of the food on my plate because I was either too stubborn to listen to my parents when they told me to finish it, or the food just tasted really bad (sorry Mom). My parents would do the “make him feel guilty” trick by saying, “You know, there are starving kids in Africa who would love to eat this food that you are wasting.” That was pretty much the same moment I would drop the food on the floor and feed the not-so-starving dog. I don’t know why people use the starving kids in Africa as an excuse to not waste food. What about the starving kids in Canada? Or even closer…Cleveland, Ohio?! Does it make us feel better to pretend that only other countries/continents have hunger issues? A little local fact: Cleveland Foodbank helped provide over 30 million meals to families in need around the Greater Cleveland area this past year. As great as that sounds, the need is for 50 million meals! 16, they held their annual food drive outside of Progressive Field. With a huge help from Progressive Insurance, they were able to collect enough food for close to 7,500 meals! We even had about 15 Progressive IRV’s stop by the ballpark to drop off over 155 boxes of food. The next portion of our “Week of Caring” involved our front office employees swinging by the Cleveland Foodbank to help sort, package, and fix up some meals on the morning of November 18. Partnering in the community once again were our friends at Progressive Insurance, who took over the afternoon shift after the Indians employees finished the morning shift. Our final day of the “Week of Caring” ends with a Thanksgiving Dinner served by members of the Indians executive staff, including Mark Shapiro, Paul Dolan, Chris Antonetti, and many more! Five local charities were invited to bring 75 people each to attend the dinner at no cost to them. Delaware North Companies (the food partner with the Cleveland Indians) prepared and donated the food. The dinner takes place on Sunday, November 20 and is intended to provide a hearty Thanksgiving dinner for those families that may not have been able to afford one.